Westchester Broadway Theatre’s [WBT] co-producers Robert Funking along with William Stutler, put on their first show “Kiss Me Kate” on July 9, 1974, and learned soon after that musicals were what their audiences wanted. Funking says they are looking at increasing special concerts in 2019 having seen success this season with Doo Wop tributes, Rock n’ Roll and comic appearances. While there has been a steady increase in the prevalence of other entertainment sources over the years such as numerous TV networks, and social media, Funking and Stutler concentrate on shows that attract a middle-aged and upwards audiences, but also get the attention of many younger show attenders. Targeting Westchester, Rockland, Bergen, Orange and Putnam counties, as well as Connecticut and the rest of the Tri State area, WBT has survived, providing work year round for a staff of 125-150 people. The theatre, based in Elmsford, has given hundreds of thousand of dollars to charities and provided an entertainment center that competes with Broadway in New York, paying Actors Equity wages under a special contract. 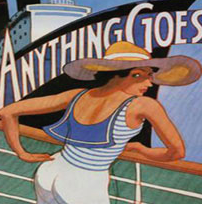 Following “Anything Goes” will be “Phantom,” then Dickens’ “Christmas Carol” and then Phantom again in 2019. WBT offers many different ticket packages and savings on season-long subscriptions and some really good entertainment.